ConceptDraw products use a cloud-based license model. If you purchase a license from our web store, your license will be automatically added to your ConceptDraw.com account and saved there permanently. To download a ConceptDraw product, and switch on your trial or purchased licenses, you need to register on the ConceptDraw website. 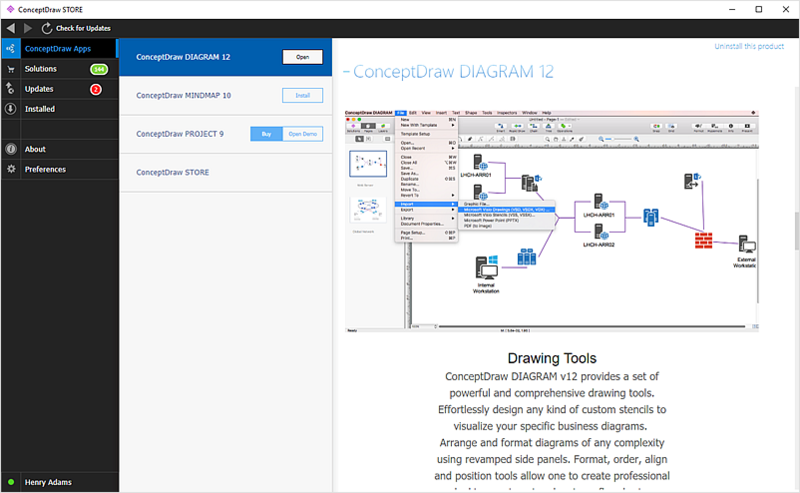 Then you will be able to download and install ConceptDraw products. Once the download and installation completed, ConceptDraw STORE runs automatically. Trial and purchased licenses listed in your account will be delivered to your computer automatically after you sign in to STORE with your ConceptDraw account. STORE provides you with a set of options to help you download, install and uninstall ConceptDraw products. The product control panel is located on the ConceptDraw Apps tab. It displays a list of ConceptDraw Products and possible operations depending on your license type. “Install” — You can download and install the full version of a product you have already purchased from our online store. “Buy/Open Trial” — If you have ConceptDraw software already installed, and the 21-day trial period has not expired, you enable to start buying a product, or simply run a trial version. “Buy/Open Demo” — If you have ConceptDraw software already installed, but its trial license is expired, you can start buying a product, or run the installed product it in the Demo mode. “Buy/Install Trial” — If you don’t obtain any licenses yet, you can start buying a product, or download and install a trial version. The right panel of the ConceptDraw STORE window displays information related to the selected product. Besides reading product information, you can run any installed ConceptDraw product using the “Open” button.